Anglian Building Products has completed a pilot property installation for Catalyst Housing Group’s Retrofit Project on behalf of managing contractor Chas Berger & Son. The Victorian solid walled property in Reading is owned by Catalyst Housing Group and was selected as part of their energy transformation pilot works to receive external wall insulation. The External Wall insulation was applied using Structherm’s External Wall Insulation NSC2a. This involved the application of a 90mm Phenolic insulation board onto the solid wall, followed by a mesh, bedded into 6mm of cementitious base coat render, then a cream coloured top coat of 1.5mm acrylic applied. The property has been extensively refurbished with new kitchen, bathroom, boiler. windows, doors and internal wall insulation to the front and side elevation. A temperature probe was embedded into the render top coat on application to enable Catalyst Housing Group to monitor the energy efficiency of the property, prior to specifying improvement works to the rest of their housing stock. A considerable change in the U-value of the property has already been identified with a reduction from 2.08W/m2/k to 0.20W/m2/k. Catalyst Housing Group is to monitor the energy efficiency of the property in great detail over the next year. The external wall insulation installation took Anglian five days to complete. An award-winning stone-built free house with low beams and roaring open fires will be even cosier now that it has been fitted with 25 PVC-U replacement windows by Leicester-based Aston Windows. 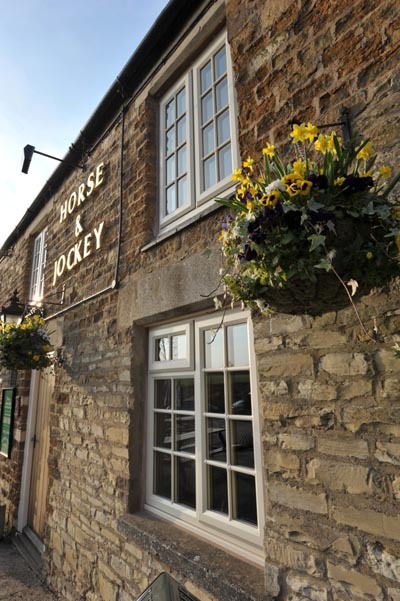 The company was asked to fit the cream coloured windows at the Horse and Jockey in the attractive Leicestershire village of Manton, by pub landlord Jason Allen. Since completing the project, Aston Windows has won another job from a customer who was impressed with how good the windows looked. Jason was particularly concerned about the heat loss through the pub’s existing single-glazed timber-framed windows, along with the high level of ongoing maintenance they required. He wanted to replace them with thermally efficient, low maintenance windows that would retain the aesthetics of the traditional building. 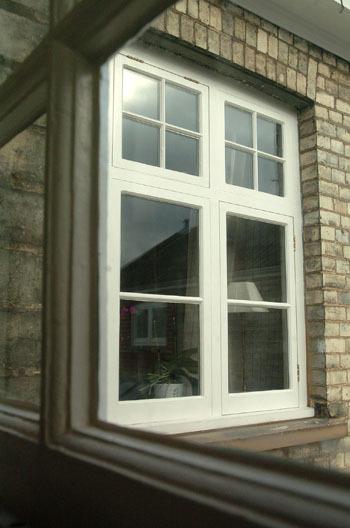 Aston Windows recommended unique cream coloured window frames fabricated using the Eurocell Eurologik profile system, with optional Georgian bars. Eurocell uses a distinctive through-colour extruded cream for its profiles to retain their pristine aesthetics over time. It also offers a full range of matching cream profiles including roofline, window trims and door panels. The Eurologik profile can be used to create many styles of windows, and was particularly suitable for this installation where old timber frames were being replaced because the 70mm system helped the installers achieve unbroken plaster lines for a seamless finish. French casement windows, fabricated using the Eurologik profile, were fitted to the pub’s first floor living area to ensure a ‘means of escape’ during a fire. Top and side opening casement windows were installed on the ground floor. 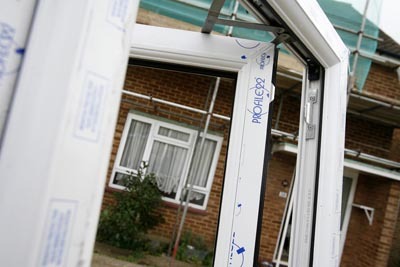 To further improve the thermal performance, Aston Windows fabricated the Eurologik frames using PVC-U Thermal Inserts. These are manufactured by Eurocell from 100% post consumer recycled PVC-U, from end of life frames returned from site, providing enhanced levels of sustainability. ISG has secured its latest project under the North West Construction Hub Framework, taking a £2.8 million scheme with Cheshire West and Chester Council. The project will extend and adapt the former junior building at The Acorns Primary and Nursery School in Ellesmere Port to provide a 315 place (10 class) primary school. ISG will carry out a carefully phased refurbishment of the existing junior school building, including minor remodelling works, installing new ceilings and floor finishes and general decorative improvements. Over the summer holiday period, ISG will also completely re-roof this area of the building. Additionally, a new single-storey steel frame extension will be built to provide an all encompassing Early Years Foundation Stage facility with Community Room. The new extension will feature a bank of roof mounted PV cells helping the building to achieve a BREEAM 'very good' rating. The project also involves the provision of external play areas and a covered all weather area to the rear of the nursery. The scheme is scheduled for completion in October 2011. The highest environmental rating achievable in the UK, gained at a new youth and community building, is helping create a legacy for the 21st century – in part due to Passivent. The YMCA’s new George Williams Centre in Bridgwater is aiming to be the first community building in the South West to achieve BREEAM ‘outstanding’ accreditation. 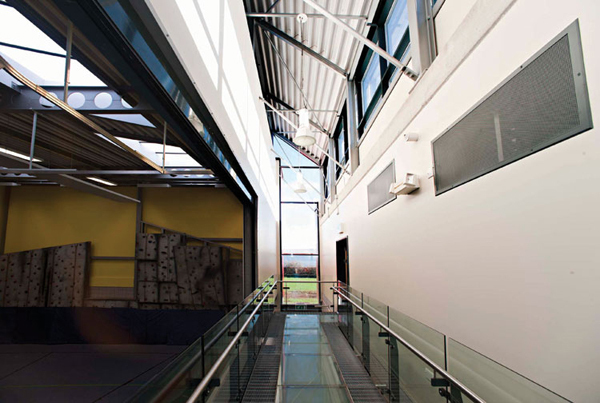 Key to the energy efficiency of the £5m state of the art facility is the inclusion of natural ventilation, designed and supplied by Passivent. The ventilation harnesses natural air movement principles of convection and the venturi effect through a combination of ‘passive stack’ and cross ventilation strategies in the two-storey multi-use centre; the only electricity consumed is the little required to operate the motorized louvres and control panel to ensure appropriate fresh air flow into the building in line with the ventilation requirements laid down by the Department for Children, Schools and Families. Passivent’s strategy uses roof level Aircool window units to act like a chimney, exhausting the ‘used’ warm internal air. Fresh replacement air is drawn into the ground floor common room and first floor function room and ‘break out’ rooms via low level louvres, with insulated wall-mounted louvres ensuring transfer of the fresh air into the atrium. The latter have been acoustically treated, to minimise noise transfer from room: atrium and vice versa. The whole system is regulated by Passivent’s iC6000 intelligent multi-zone controller, which monitors internal and external; temperatures and CO2 levels in each area, adjusting the louvres and thus airflow as required in each area to maintain the pre-set temperature and air quality levels. A push-button switch in each room enables occupants to over-ride the management system if required. As it focuses on continuous natural air movement, the system works 24/7, providing free night cooling when the building is unoccupied, and ensuring a comfortable, fresh internal environment each morning. Stafford Aluminium Windows has landed a £5million plus contract to supply new WER ‘A’ rated windows to a Midlands local authority using the FS70 PVC-U system from Profile 22. The trade and commercial fabricator was awarded the project late last year by Dudley Council to supply 250 plus windows per week for the duration of the five-year contract. Dee Benning, operations director, said: “This is a significant contract for us. It brings a huge amount of security and stability to our business at a time when fabricators more broadly face a huge amount of pressure and economic uncertainty. Stafford Aluminium was founded in 1977 by owner and managing director Steve Allcock and in addition to securing more than 60 jobs, the contract win will create a further 15 posts. It follows a number of recent new business wins including Stafford College and RAF Brize Norton in Oxfordshire. In February Profile 22 became the first and to date the only PVC-U window systems company to secure a dedicated A+ rating across all domestic applications for its low carbon recycled window system RECO22. The system, developed specifically for the commercial sector, features profile extruded from 10% recycled PVC-U and a thin foiled colour or wood grain finish, added to ensure colour uniformity and to deliver an enhanced aesthetic. Rehau’s Awadukt Thermo ground-air heat exchanger has been installed as part of the new Weymouth community fire station development in Weymouth, Dorset. It will be used to provide a renewable source of controlled ventilation in the atrium/reception area of the new building using just a small fan in the filter enclosure. The system works by drawing fresh, filtered air into the glass fronted building through a series of optimised polypropylene pipes laid 1.5m below ground. Heat transfer takes place via the polypropylene between the ground and the air – pre-cooling it by as much as 14ºC in summer and pre-warming it by as much as 9ºC in winter before it is delivered into the reception area. The Rehau pipework has been installed beneath the new fire station in a 40m x 18m grid using 250mm dia heat transfer pipes and a 400mm dia header pipe in a Tichelmann grid formation. One end of the grid terminates into a floor grill in the atrium/reception area and at the other end of the system a specially designed air inlet houses the filter, fan unit and control dampers. An antimicrobial layer inside the pipework made of silver particles prevents microbial growth which could cause musty smells and an airtight condensation collection chamber ensures there is no risk of condensate build up. The system was installed by Markline Construction, working on behalf of main contractors Morgan Sindall for Dorset Fire Authority. The building designers on the project who designed the air inlet were Tetris Solutions of Altrincham, and consultant engineers were Upton McGoughan. Construction is ongoing and the new fire station is expected to open in June 2011. Stormsaver has won a new contract on a major new health centre in Hull. The Bransholme Health Centre, is being delivered with an investment of £14.7million by local company Citycare as part of Hull’s NHS Local Improvement Finance Trust (LIFT) programme. The state-of-the-art development will provide an extensive range of primary care and community services for people in the Bransholme area, including the relocation of GPs from the current health centre and support for weight management and smoking cessation. 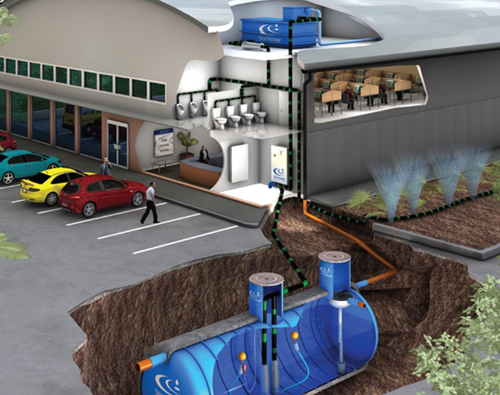 Stormsaver has been contracted to supply a 20,000 litre rainwater harvesting system. The below-ground, non-pressurised system will collect approximately 880m3 of rainwater each year from the centre’s 1,500m2 roof area. The harvested rainwater will be used for the flushing of 30 toilets and urinals, offering a sustainable way to reduce water bills and lower reliance on mains water. Due to be completed in the Summer of 2012, the rebuild of the Darwen Vale High School and Engineering College in Blackburn is now well underway. When finished, the 8000m² campus building will provide for a 1200-place community school, housed in a new, environmentally sensitive building. Already complete and opened in January 2011, the new sports arena can be used by the public, both outside and during school hours. It includes a fitness suite, fully equipped sports halls, upgraded pitches and courts. The arena has been provided with a 400m² car park drained with the first UK installation of Hauraton Drainfix Clean filter-bed channel system. These drainage channels directly cleansed rainwater runoff from the car park into a controlled water course which is part of the area’s SUDS scheme. Legislation now demands surface water runoff from hard surfaces is managed to mitigate local flooding. It also requires rainwater running off car parks, yards, trading estates and highways be cleansed of pollutants before it enters a controlled water course or seeps into ground strata. 1. Channel run made up of 1m-long, 300mm (usable) width x 505mm (usable) height fibre reinforced concrete channels. Each channel having a maximum retention volume of 70 litres/m. 400mm width channels are also available, with a retention volume of 110 litres/m. 2. 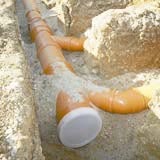 100mm Diameter mesh drain pipe made of highly durable PE-HD and covered with a geotextile tube. Supplied in 1m lengths with push fit socket for connection on site. 3. Carbonate substrate granules to create filter-bed, supplied in bags to site. 4. Ductile iron bolted down gratings with a load category of D400. Supplied palletised. Gratings with a loading category of E600 and F900 are also available. 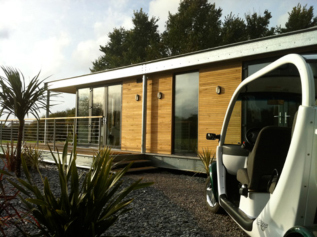 The inclusion of solar PV technology was essential when chartered surveyor Tony Dawkins built his own grand design. Tony decided on a roof integrated 3.17kWp Redland Duoplain PV Tile system, the 72 PV tiles fitting flush with the surrounding Duoplain concrete tiles to give an aesthetically pleasing roof satisfying planning requirements. Tony said: “I designed and specified the house and wanted to build it in excess of current building regulations for energy efficiency. To achieve this I knew some form of renewable technology would be required. Having looked at all the major PV manufacturers, I decided on Redland. 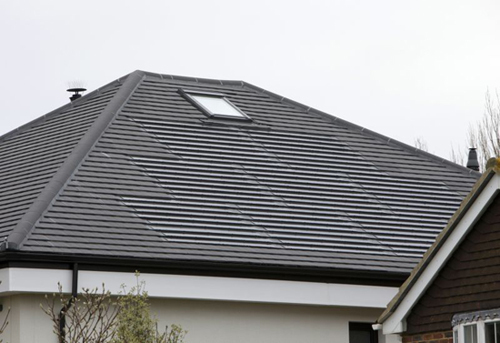 Tony also wanted to have one contractor install the traditional roof tiles and PV system, minimising the risk of damage during the installation while taking advantage of the Redland 15-year guarantee for the entire roof. Residents in Kent Grove, a sheltered housing complex in Chesterton, Staffordshire run by Aspire Housing, are expected to save over £100 on their annual electricity bills as a result of their homes being equipped with high-efficiency photovoltaic solar panels supplied by Schueco UK. 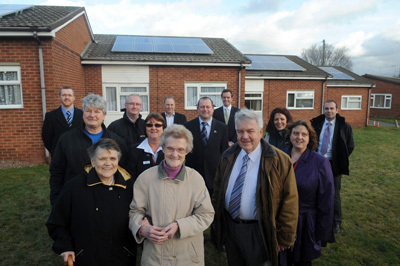 In all, 29 bungalows and a community hall are now solar-powered at a cost of £235,000, jointly funded by Newcastle-under-Lyme Borough Council and Aspire Housing, that won a competitive tender process for £100,000 worth of eco-friendly council funding. The installation process was undertaken by local company BGC which runs a training centre to educate young apprentices in all aspects of renewable energy. With Phase 1 now successfully completed, residents are said to be delighted at the prospect of seeing their future energy bills substantially reduced. Aspire Housing is part of the Aspire Group which works across North Staffordshire and South Cheshire. Commenting on the Kent Grove scheme, Will Nixon, Aspire Housing’s director of regeneration said: “In a recent consultation, customers told us that making their homes more energy efficient and reducing running costs is a priority. We are very pleased to work in partnership with the borough council to deliver this scheme which will make it more affordable for our customers at Kent Grove to heat and light their homes, as well as reducing the environmental impact of the scheme. Part of a major refurbishment of a historic, canal-side property, a new build, Grade 4 basement has been created to house a recording studio, gymnasium and swimming pool. 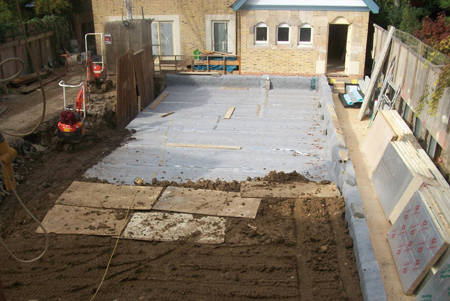 The new basement extends beyond the footprint of the property underneath the garden, and this section has been covered with a green roof which will be landscaped to reinstate its former appearance. As an optimum method of waterproofing, a combination of two systems (liquid applied and cavity drain membrane) was specified by architects Rundell Associates and the main contractor, 800 Group, was able to source both systems from Triton Chemicals. This approach avoided the split responsibility issues often encountered when multiple suppliers are involved. All aspects of the waterproofing project were overseen by the Triton technical team. The new subterranean room accommodates a swimming pool and is covered with a 300m² turf roof. Triton’s TT Vapour Membrane was used as the primary method of waterproofing the new ground slab (basement roof) and this was covered with Platon Double Drain membrane to form a protective layer for the primary waterproofing and a drainage layer for the turf roof construction. TT Vapour Membrane is a liquid applied coating (NBS Clause No J30) which, once cured, provides a waterproof and ground gas proof barrier. The new slab was laid to falls and two coats of TT Vapour Membrane were applied at a rate of 1 Litre/m² (each coat) to the slab, and returned to the upstand wall and in to pre-formed drainage discharge outlets within the upstands, which direct any excess water to a land drain below slab level. Platon Double Drain membrane (NBS Clause J40) comprises a studded HDPE membrane with a Geotextile fleece layer which is heat-welded to it at manufacture. Laid with the fleece layer uppermost, this filters any fines, clay or soil from entering the intended drainage/water collection point. Homeowners in Cambridge and Essex have waved goodbye to high energy bills thanks to window specialist Ventrolla Cambridge and Essex. Ashley Ford from Colchester instructed Ventrolla to restore six sash windows at the front of his semi-detached property that is situated in a conservation area and dates back to the 1880s. He has lived in the property for ten years and decided to have the repairs carried out to limit disruption from outside noise, reduce unnecessary heat loss and lower his energy bills. Along with fully restoring the windows, Ventrolla installed its Perimeter Sealing System into the gap around the sashes. The seal is designed to eradicate draughts and rattles, while ensuring that the sliding action of the windows becomes smooth. He was so delighted with the completed work he called Ventrolla back to draught-proof the front door. The renovations did not go unnoticed by local residents and two of Mr Ford’s neighbours soon placed orders with Ventrolla. Down the road in the small hamlet of Bures on the Essex and Suffolk border, the sash window renovation specialists completed renovations on Lorna Wood’s period home. A friend recommended Ventrolla to Mrs Woods, the owner of Grade II listed Brook House, and she has been delighted with the service she received. Mrs Woods said: “We staggered the work over a couple of years and had a few windows done at a time. On each occasion the fitters were fantastic and incredibly efficient, causing very little disruption. Completing the hat-trick of happy customers is Charles Norris from Cambridge. He enlisted Ventrolla as soon as he moved into his new home in a conservation area in the centre of the city in 2009. Mr Norris said: “Our architect recommended Ventrolla. Our house is full of interesting windows – some sash and some casement. The triple window in the dining room needed to be replaced and Ventrolla did a wonderful job at keeping it consistent with the originals. Ventrolla scheduled the work around other building work being carried out on the house. The Edge is an exclusive development of just 10 low-energy two- and three-bedroomed luxury holiday homes which is built to level 4 of the Code for Sustainable Homes. This standard goes beyond the level of insulation and low energy statistics demanded by current Government guidelines for traditional new build homes. The Edge offers purchasers the ultimate in modernist holiday home luxury set in an area of outstanding Cornish coastal beauty. These contemporary homes are modular steel frame built with floor-to-ceiling triple glazed windows to allow the sun to flood in and warm the interior, with a wrap-around deck to maximise usable living space. Inside high quality fixtures and fittings have been used, with Italian kitchens, top brand appliances, beautiful floor coverings, doors, and concealed lighting to give a sense of peace and comfort. Vicaima doors were chosen to mirror the high quality interiors of these unique boutique holiday homes. Interior doors were specified from Vicaima’s Easi-fit door kit range, which offers style and variety for a wide range of interior projects where fast on-site assembly is needed. Naturdor N1000 Oak 0.5H was used to a size of 826x2040x44 with 100mm wide primed MDF frames which were factory built as sets, complete with ironmongery, and supplied for easy and fast installation in-situ. A further order is currently being fulfilled for this project using 40mm solid core Oak Naturdor. Easi-fit has become the range of choice amongst specifiers and installers where a total door solution is required.